The Awesome Zapman Cover Chapters 1-5 - The Awesome Zapman Chapter 30 - Night Of The Possum!Chapter 29 - Lunch Special!Chapter 28 - On The Edge Of Disaster!Chapter 27 - Of Mice And Zen!Chapter 26 - Our Neighbor, Our Enemy...Chapter 25 - Fade To Black...Chapter 24 - Ghost Of A Chance...Chapter 23 - Midnight InterludeChapter 22 - Meals On WheelsChapter 21 - The Tell Tale TailChapter 20 - Baby Baby!Chapter 19 - Going Going Gone!Chapter 18 - ...To Live Another Day!Chapter 17 - Curiosity And The CrookChapter 16 - Decision Time!Chapter 15 - Loose ThreadsChapter 14 - "Fly Me A River"Chapter 13 - Home Invasion!Chapter 12 - Knock Knock...Who's There?Chapter 11 - Never Play Chicken...Chapter 10 - A Pound Of FleshChapter 9 - Turning Over A New LeafChapter 8 - "Scream, Wilhelm, Scream! "Chapter 7 - Parts UnknownChapter 6 - The Alien ReprobationChapter 5 - Talk Softly and Carry a Big SchtickChapter 4 - Chariots of LiarsChapter 3 - The Laws of ManChapter 2 - The Path Less TravelledChapter 1 - Behold...The Zap-Man Cometh! Select StoryChapter 61 - EXITChapter 60 - Fear Itself!Chapter 59 - Going Ape!Chapter 58 - Dino Jaws!Chapter 57 - Sweet DreamsChapter 55 - To Sleep...Perchance To Die!Chapter 54 - False AwakeningChapter 53 - Morpheus RisingChapter 52 - RetrospectionChapter 51 - Johnson Pulls OutChapter 50 - Run!Chapter 49 - Zap-Man MissingChapter 48 - Chitter ChatterChapter 47 - Now Fall The Mighty!Chapter 46 - Revelations:101Chapter 45 - Aye,Robot...Chapter 44 - The Old Man And The SeizeChapter 43 - All Choked Up!Chapter 42 - That Was No Nightmare...That Was My Life!Chapter 41 - Habeas CorpsesChapter 40 - A Clothes Horse Of A Different ColorChapter 39 - "Busted! "Chapter 38 - Night Of The Bighead!Chapter 37 - Reality Check, PleaseChapter 36 - Bare EssentialsChapter 35 - Lab ResultsChapter 34 - Sightings!Chapter 33 - Drop Zone!Chapter 32 - Wash And WaryChapter 31 - Don't Look In The Basement!Chapter 30 - Night Of The Possum!Chapter 29 - Lunch Special!Chapter 28 - On The Edge Of Disaster!Chapter 27 - Of Mice And Zen!Chapter 26 - Our Neighbor, Our Enemy...Chapter 25 - Fade To Black...Chapter 24 - Ghost Of A Chance...Chapter 23 - Midnight InterludeChapter 22 - Meals On WheelsChapter 21 - The Tell Tale TailChapter 20 - Baby Baby!Chapter 19 - Going Going Gone!Chapter 18 - ...To Live Another Day!Chapter 17 - Curiosity And The CrookChapter 16 - Decision Time!Chapter 15 - Loose ThreadsChapter 14 - "Fly Me A River"Chapter 13 - Home Invasion!Chapter 12 - Knock Knock...Who's There?Chapter 11 - Never Play Chicken...Chapter 10 - A Pound Of FleshChapter 9 - Turning Over A New LeafChapter 8 - "Scream, Wilhelm, Scream! 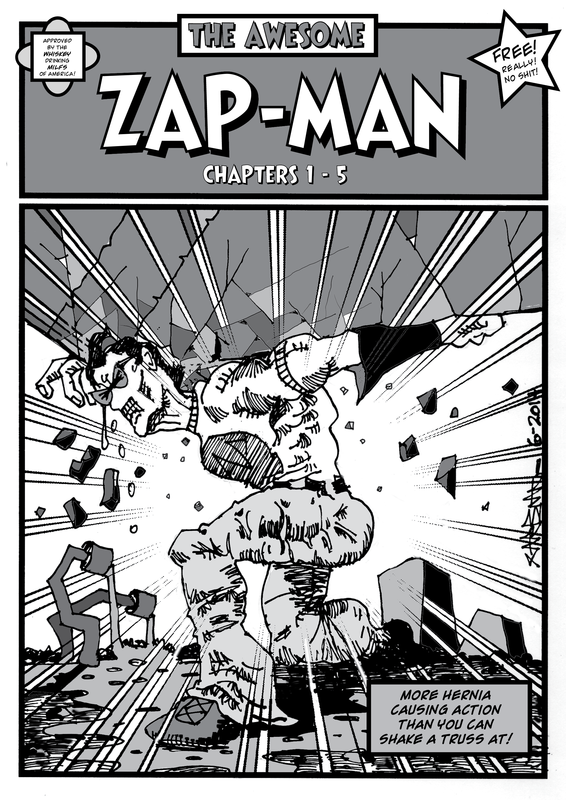 "Chapter 7 - Parts UnknownChapter 6 - The Alien ReprobationChapter 5 - Talk Softly and Carry a Big SchtickChapter 4 - Chariots of LiarsChapter 3 - The Laws of ManChapter 2 - The Path Less TravelledChapter 1 - Behold...The Zap-Man Cometh!